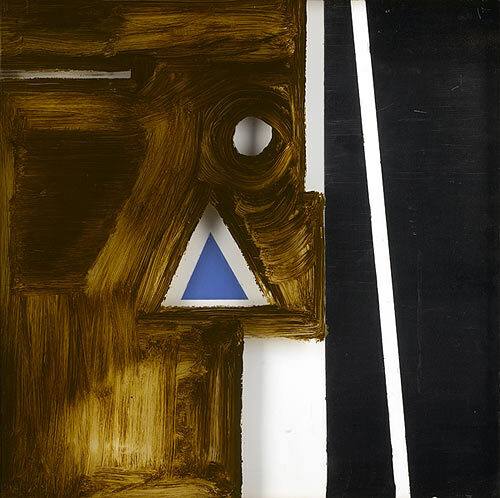 A related, later composition, is in the collection of The Laing Art Gallery, Newcastle. 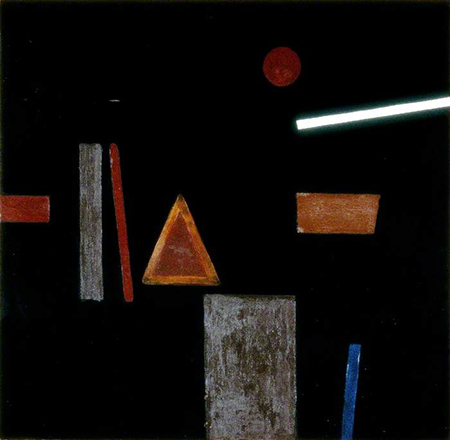 Rowntree developed sequences of works on a single there permitting the viewer to trace the variants..... Three variations called Shapes in Movement II followed Black Painting. Their perspec upper surface has another layer below so that changes appear as the viewe rmoves. Shapes on Blue II finally relinquished the triagle motif, but retained the 'cue' motif. A final variation was constructred in perspex, a specific response to the demain to use synthetic materials. Here the variation is almost independent of its theme. Structurally close to Pasmore's work, its wit is wholly Rowntree's. This was an intellectual and creative dialogue more radical than the Royal College provided. It was a game Rowntree played his own way, adding an edge of irony that delighted him.